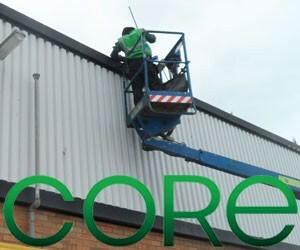 At Core, we take cleaning at high levels very seriously. Our staff are always trained to the highest standards in the use of both appopriate techniques and equipment. Based in Worthing, West Sussex and operating through Sussex, Surrey and Hampshire. As well as cleaning everything you can see, we specialise in cleaning everywhere that you can’t too. Our overhead cleaners are expert in commercial and industrial environments, on a timetable to suit you. Regular overhead, high level cleaning is important for many businesses as difficult to reach area including ducting, joists, cabling, beans and other overhead features such as suspended light fittings can collect dust and debris. If dirt and dust that has collected in these areas is disturbed, it can have a detrimental affect on your staff, production machinery and products. To avoid such problems, regular cleans are recommended. 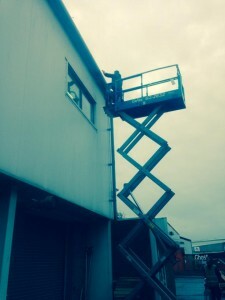 However, this task can’t be carried out by just anybody; Core employ a staff of specialist overhead cleaners who are experienced in using a variety of access machinery and equipment, from harnesses and cradles to cherry pickers and scissor lifts. Much of the overhead work can be carried out without disruption to your business. We pride ourselves on being fast and efficient and are perfectly happy to schedule our services to take place out-of-hours. Our staff treat dust and detritus very carefully, ensuring that the material that they are dealing with is contained without risk of recontamination of your workspace. All of your machinery and equipment is shielded to protect from cross contamination during cleaning and the material we collect is safely and hygienically removed. glass roofs and difficult to access architectural features. As well as posing an unacceptable health and safety risk of contamination, dust build up can also provide a perfect environment for infestation and also poses a fire risk. Regular cleaning will prevent this risk, making your workspace healthier and safer. 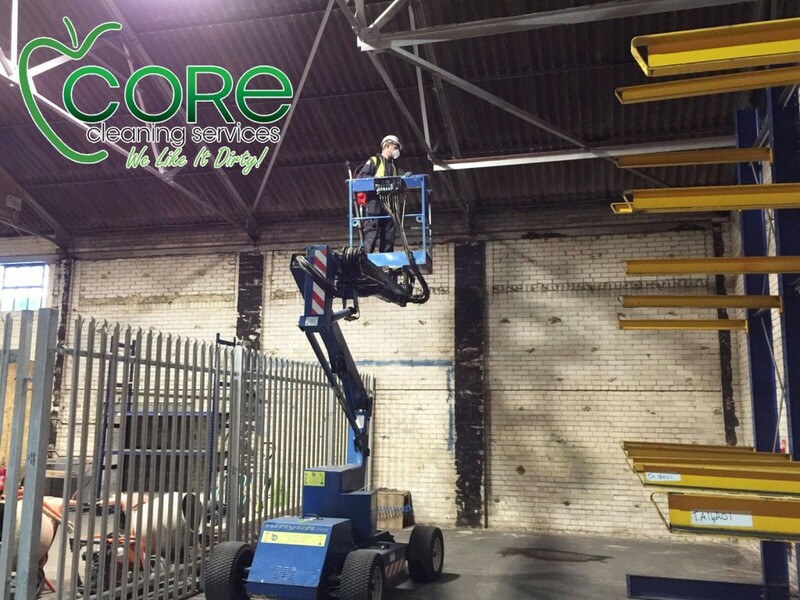 This means that whether your business is concerned with food manufacture or storage, commercial, light industrial, industrial or an office space, Core provide a specialist, tailored service that is created to suit your specific cleaning requirements. All of the staff who are trained in overhead operation are experienced and qualified to operate the necessary machinery and hold ManSafe certification. 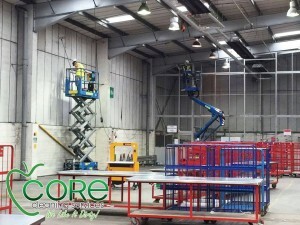 Core are in the privileged position of being able to provide specialist high level cleaning and maintenance services. This means that our overhead services can be delivered on a regular basis as part of your cleaning routine, or alternatively, as part of a one-off deep clean at the beginning or end of a property lease. 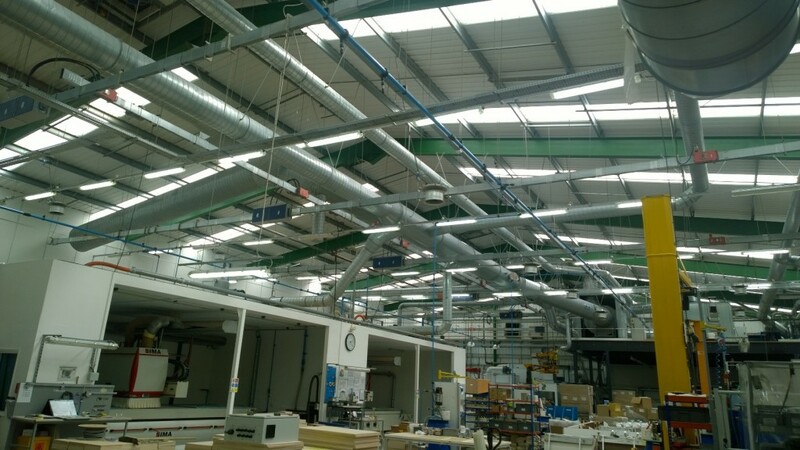 Our ducting service is suitable for any business that has difficult to reach overhead fixtures that include air regulation and supply. Because they are hard to reach and so easily overlooked, vents can become stiff, or altogether inoperative. Regular cleaning reduces the chances of failure, blockage or inefficient operation. We use a range of high tech methods and devices to access even the hardest to reach points and remove dust and greasy dirt effectively and hygienically. We offer duct and air vent cleaning as one of our overall industrial premise cleaning services. 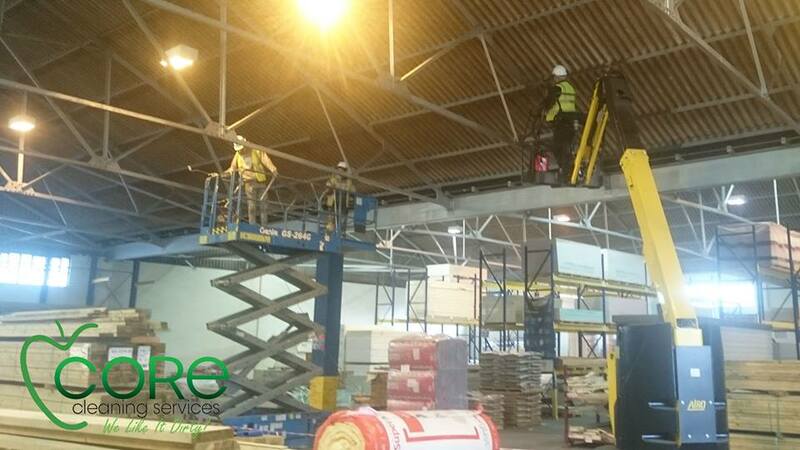 The full warehouse and industrial service includes waste removal, floors and maintenance, lavatory and hygiene product replenishment and disposal. Core can provide a one-off deep clean which includes ducting, air vents, trunking, shelving and storage, lighting, windows, floors and lavatories. If you’re moving into or out of premises we offer a pre-clean and end of lease clean, meaning that you are both health and safety as well as lease compliant. Because ducting is both hard to reach and delicate it requires specialist cleaning techniques and equipment to keep it properly maintained. 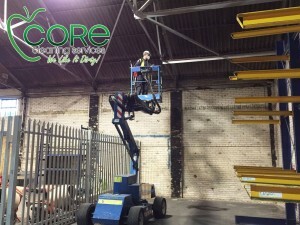 Core employs a staff of professional cleaning operatives who are trained in the requisite skills for undertaking such work, including handling equipment and overhead working. We undertake regular training so that our staff are always H&S compliant as well as being familiar with the latest, safest methods. The techniques we employ to clean ducting and similar overhead fixtures carry no risk of reintroducing dust or dirt back into your workspace. When duct and vent cleaning is carried out on a regular basis, it also ensures that your staff are happy and healthy while the goods you produce or store are contaminant free. We do everything we can to limit the impact our duties have on the smooth flow of work for your staff so, where we can, we undertake most of our work outside of normal working hours, however, if your business operates during unusual hours, we are happy to liaise to arrange a time when the work can be undertaken in order to cause the least disruption.